That’s not a typo: I said brains. It’s Halloween week! and around my house, that means Halloween craft projects, a near-constant debate over what costume to wear, and me holding off on buying candy until right before Halloween night due to my lack of control around the sweets of my youth. 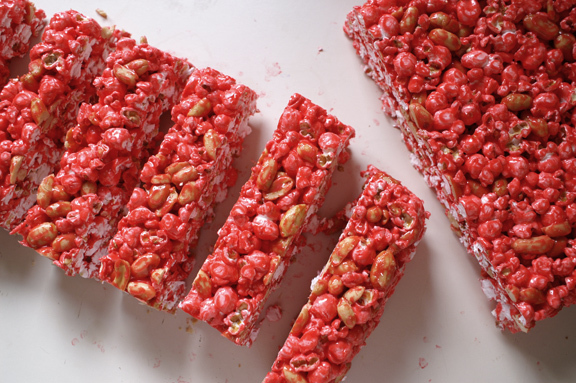 Conceptually, these are straightfoward: popcorn + cocktail peanuts + sea salt to taste, dunked in a melted butter + marshmallow + food dye mixture = bloody brains. Take those brains and press them into a 13 x 9 pan, and voila! Bloody brain casserole. Yum. Then all you do is take a big knife (like one you’d use to murder a burglar or something; that knife), cut these into 48 squares, and dip them in some molding chocolate, and that’s when the fun begins. I used Chocoley again for these – their extra dark formula, which works tremendously well with the sweet marshmallow popcorn salty peanuts – and it’s fast becoming my go-to chocolate for projects like this. It just makes the coating process so. dang. simple, which isn’t always easy to come by. Try using regular baking chocolate for stuff like this, and you’re liable to end up with weird chunks, uneven coating, and a generally “off” texture to your finished product. The Chocoley is like working with chocolate silk curtains: it just glides over anything – even lumpy brain popcorn, as you can see here – and hardens perfectly so you don’t have tons of runoff. Like when you hear the word “enrobed,” that’s what this chocolate does: it enrobes, which ensures you won’t end up with struggle treats. So much fun. How cute are these? If you’re having a Halloween party, I have a game for you: kids or adults, makes no difference. I’m kicking it like Martha Stewart today, I know. Make 2 batches of bloody brain petit fours (or better yet, halve the recipe and make it in 2 8×8 pans): dye one batch red and one batch green. Cut each batch into 24 squares and dip according to directions, making sure to completely coat the popcorn. Decorate as you wish, but make all of them look the same on the outside. Serve each party guest 1 petit four; mix them up so you don’t know who’s getting what. So you make sure to get even teams, count out an even number of each color before serving. When it’s time to play, have guests bite into petit fours to reveal whether they will be a human or a zombie. 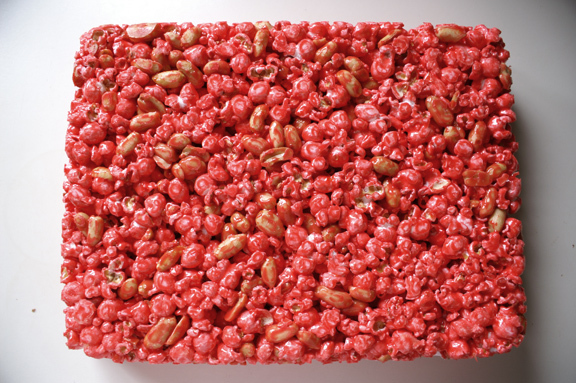 Watch them roll their eyes in joy because these popcorn squares are delicious. Proceed to chase each other around like total children as you would in a game of “Cops & Robbers.” It will be the most fun you’ve had at a party in a long, long time. So there you have it: not terribly complicated, just like the brainy petit fours, yet super fun, just like the brainy petit fours. You’ll be a Halloween hero, and quite possibly the neighborhood show off, because they’re also pretty adorable for individual bagging, which means you can hand these out to the trick-or-treaters who bang on your door. Did you order your Chocoley back when I did those backyard mint ice cream sandwiches? You should have, silly. If you haven’t, do it now, because there’s maybe nothing more fun and relaxing than swirling things around in melty chocolate that actually works and tastes spectacular. I already have an idea for Thanksgiving, so you have a few weeks to prepare. Hard to say where this was adapted from: I think popcorn balls are pretty straightforward, and I just took it from there. *Very easy to half-batch these things, especially if you’re wanting human and zombie brains (as one tends to want.) Simply halve all the ingredients and throw it into an 8 x 8-inch pan versus the 13 x 9 and oh my heavens do I ever know that square inchitude of an 8 x 8 times 2 doesn’t add up to a 13 x 9 pan, thank you. but we’re talking popcorn balls and not some classic milk sponge cake so i think we’re probably good. **Here’s what: Mr. Table dislikes popcorn balls, or rather, is indifferent to them. He says they “taste like stale popcorn.” Mr. Table has a point: something about coating even salted popcorn and peanuts in butter and marshmallow tends to negate the salt entirely, so you have to add it back. If you don’t, truly, your popcorn brains will just not be that exciting, so be generous with the salt, and taste as you mix. This isn’t caramel so it’s not going to get rock hard on you, which means you have time. Spray bottom and sides of a 13 x 9 glass Pyrex casserole generously with cooking spray. In the largest stockpot or dutch oven you have, melt the butter over medium heat. Add the marshmallows and stir constantly until smooth. Add the food coloring and continue to stir until evenly incorporated. This part goes fast, so make sure you have everything measured out before you begin. Remove the pan from heat and add popcorn and peanuts quickly, stirring with a rubber spatula; you’re looking for a motion which takes your spatula all the way to the bottom, lifts the marshmallow mixture up, over, and through the popcorn and peanuts. This will take patience and a careful but firm hand: you want your popcorn kernels intact but everything needs to be coated; very easy to see thanks to the food dye. As you mix, sprinkle with sea salt and taste: don’t be scared, because marshmallow and butter mute all salt and you’re going to need to bring it back up again, so keep sprinkling and tasting until you get it right. Chances are you won’t be done even when you think you are, so watch the bottom for pools of the marshmallow mixture. 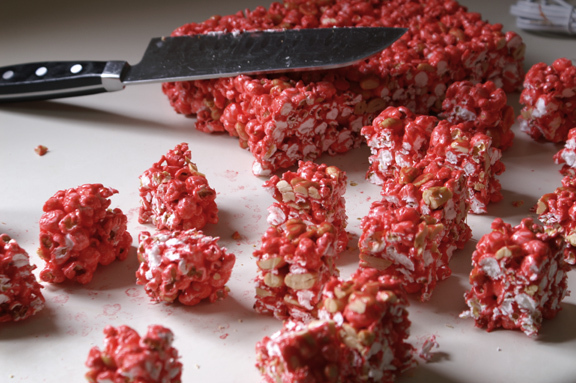 Once everything is incorporated, pour into prepared 13 x 9 casserole dish and press using the spatula until you have a firmly packed, Rice Krispie treat-looking thing. let cool to room temperature on the counter and then place in the refrigerator for 2 hours or longer to really firm up. Melt the Chocoley in a double boiler according to their instructions: it does work the best that way, even if it’s slightly different than how you melt baking chocolate. 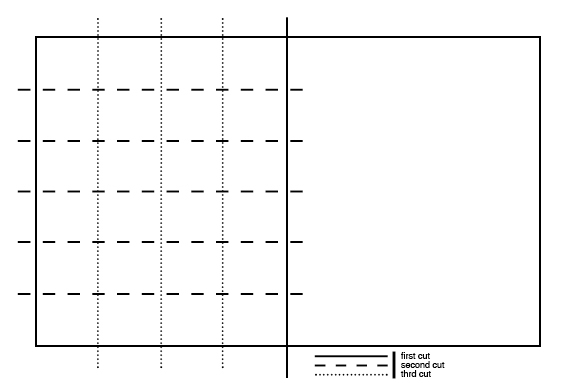 In the meantime, line 2 baking sheets with parchment paper and set at your work station. 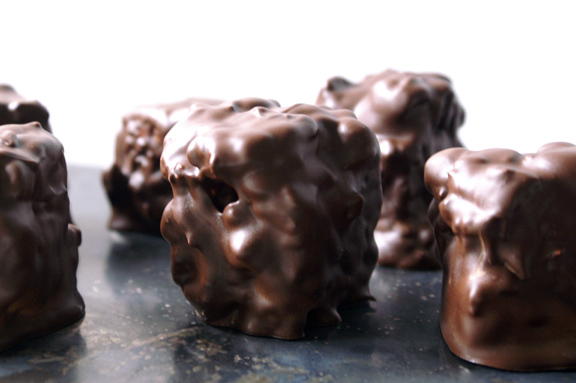 Set the double boiler of chocolate at your work station, along with the brains squares and two forks. Using the forks as grabbers (one in each hand), lift one square and place it in the melted chocolate. Roll gently around with forks until all sides are coated, then lift it up with the fork tines holding the sides and give it a little back-and-forth shake to get any excess chocolate off the bottom. Transfer to the prepared baking sheets and sprinkle with a few sprinkles, if you’re using them. Repeat, placing 24 on each sheet. Once you finish 1 full sheet, place it in the fridge to set up. Repeat with the other sheet. Serve! These are fine (once chilled) at room temperature in an airtight container for 2 to 3 days. Happy Halloween! 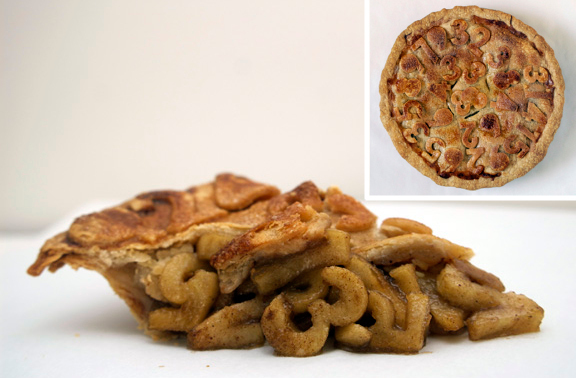 my submission for Pi day: the apple Pi. 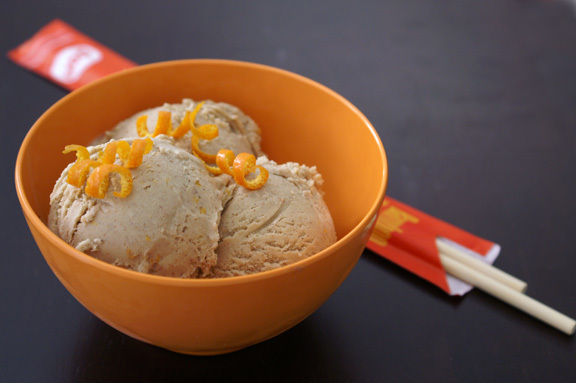 orange five-spice + chile ice cream. Brianne, your mom is my holiday cookie cutter partner-in-crime: we discussed that when i brought my (cutter) ax out a few years back, and i STILL remember she has that lobster cutter i want…badly. 🙂 I’m so happy to hear about how your mom is doing great! It’s really something, i’m sure, to feel good after so long. So i don’t know about all the ins and outs of GF eating and Celiacs, but i do know that marshmallows, Chocoley, popcorn, etc are GF. the only thing i’m unsure about is the food dye part and the sprinkles part of this, but those are totally optional. Cheers to your mom! I wish her a lifetime of happy eating. These are so creepy! Yet I want to bite right into them and eat a whole bunch. Such a great Halloween treat idea. You are one cool mom with all the amazing treats, the games…the fun! Your wee one is really lucky. Have a fun and safe Halloween! Right? And the chocolate: chocolate and popcorn go so well together, truly. Thanks! you also have a fun and safe halloween: i know here it’s freezing and very windy, so i’m not sure how much actual roaming around will get done, but definitely we’ll be eating these and celebrating. Now that’s using your brains. I mean, seriously. This is genius. Also? When you said to use the knife you would use to murder a burglar, I INSTANTLY KNEW what knife you meant. So glad to know I’m not the only one who knows exactly which knife I would reach for in the event of a break-in. Also also, your zombie vs. human game sounds insanely fun. Aaand now I’m sad that I don’t have any halloween parties to go to… but I guess that just means I can eat these all by myself without having to dress up, so, win! *bah-dum-bump. * SEE? i knew that would be a better description than “chef’s knife” or “santoku.” MORE ACCURACY. Hey, i have zero parties to go to either: i, no kidding, have like, one kid coming over with his mom tonight, but i have these and also made pumpkin sugar cookies with royal icing so the kids can make jack-o-lanterns. I don’t go overboard at all. and for like, ZERO guests so i say go for it: make them for yourself (b/c i basically did). 🙂 happy halloween! Willow said everything I wanted to say. Thanks, Willow! Fun stuff! And pretty realistic looking. We’ll be buying candy on Halloween for the same reason you do — just can’t resist all those candies that we resist for the other 364 days of the year. Thanks, John! Agree: it’s like just creepy enough to be gross, but not so terrible that you can’t eat them…at least nothing is oozing. Oh my goodness, how fun! And I was waiting for it to be some crazy complicated process, possibly involving raspberries, and I was so wrong. Thankfully. Salty-sweet marshmallow-chocolate-peanut stuff? Yes. Sign me up. DANG IT, Dana, can’t a girl do something easy?!?! seriously though from me, i would also expect some sort of raspberry reduction/essence to be involved, so i don’t blame you for thinking it: i do have a track record of steppy processes. So the “Behind the Music” story of this is that this is attempt #4: at one point there was like, 387 ingredients AND a momofuku recipe involved soooooo…guilty as charged. you know me too well. Haha! I was mostly going on the picture alone, which looks a bit raspberry-ish. 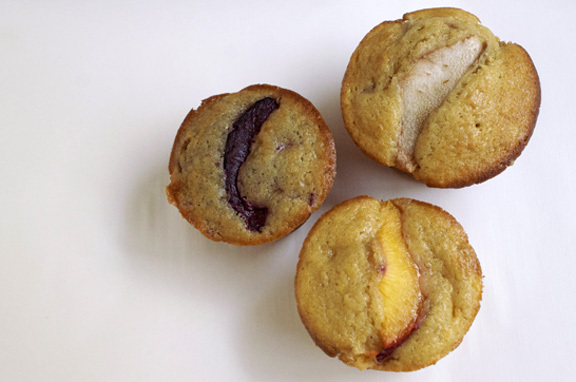 But I applaud the process that brought you to this marvelously easy recipe! Shannon, you are a genius! And so much fun! Wee One has the best mom! Plus, I love the use of a diagram, complete with legend. You’re just too awesome. Plus I need to get my hands on some Chocoley for the holidays. You guys, i think “genius” is a strong word, but i’ll take it. thank you, Ashley. 🙂 She definitely has fun, although maybe someone could explain that not every mom does this kind of stuff? I have a feeling in her little brain that this is just normal behavior for a mom. 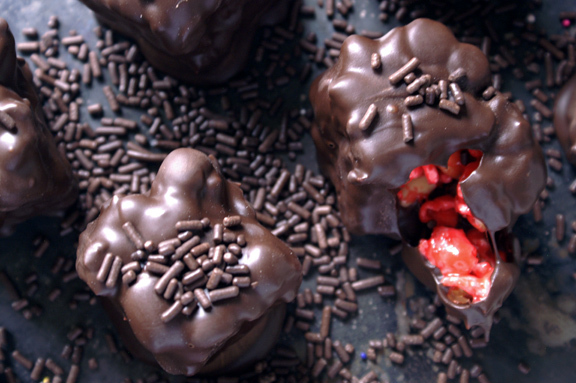 Definitely do the chocoley: i highly recommend the dark and extra dark varieties especially, and they have some super great holiday sprinkles and other supplies as well on their site. It’s a family-run company, and they make an exceptional product. I love your diagrams, and I love this gross (in a good way) dessert. This is seriously creative. 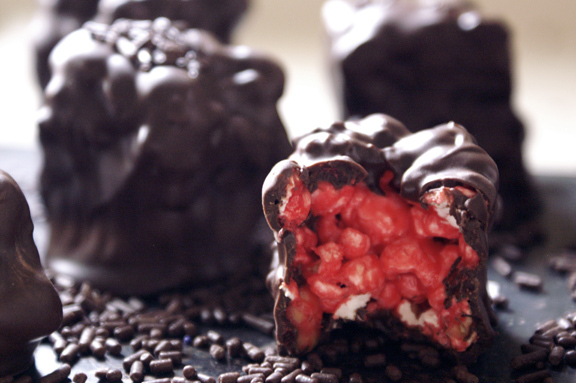 The innards sound absolutely amazing–sweet, salty bliss. Have a wonderful Halloween with the wee one. jennie, sometimes i make things specifically so i can create a diagram. If i could find a way to make one for every post? i would. i’m SHAMELESS. DIAGRAMS! I’ve been waiting for a diagram for SO LONG. I have diagrams FOR DAYS. its is bad to say i love my diagrams? it’s more that i love making them, b/c nerd. since i’m getting to comments LIKE A MONTH AFTER THE FACT, i miss these now. Do you think zombie thanksgiving brains would be appropriate? maybe zombie turkey brains…hmmm.